Today we will examine four more of these larger Pastorela Diablo masks that were collected in the Mexican state of Guanajuato. The first mask, which I purchased from Robin and Barbara Cleaver in 1999, was simply identified as an impressive Pastorela mask from the Mexican state of Guanajuato. It does pack quite a punch, doesn’t it? This mask does not have the usual openings for vision, instead the dancer looks out through the large open mouth. Today we will examine three large masks that were either found in Guanajuato or they were attributed to that state. As you will see, some could actually be from Michoacán. The first of these was collected in Guanajuato by Jaled Muyaes and Estela Ogazón, and I purchased this mask from them in July, 2001. However I now see that it looks very similar in style and design details to the pair of masks by Emiliano Fernández, of Angahuan, Michoacán that we saw in my post of August 7, 2017. For example, it has the same style of eyes, ears, spotted green open-mouthed snakes, mouth, and back design. 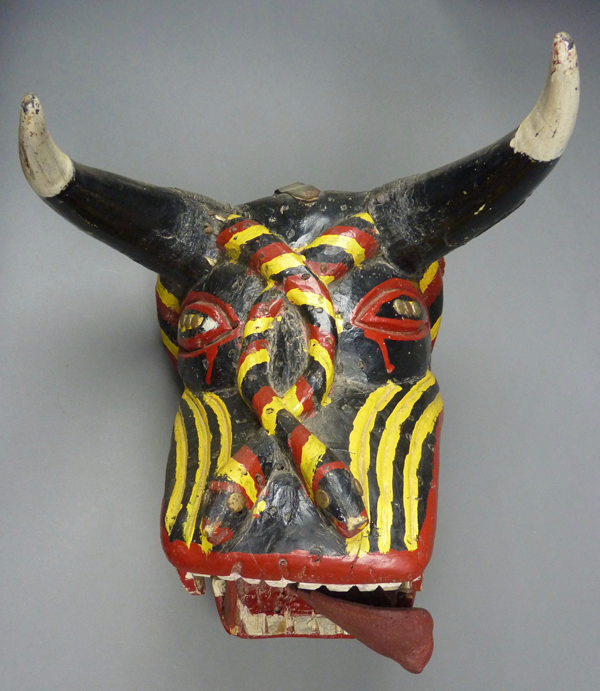 The first of today’s Pastorela Diablo masks, from Puruandiro, Michoacán is exceedingly large and ornately decorated. 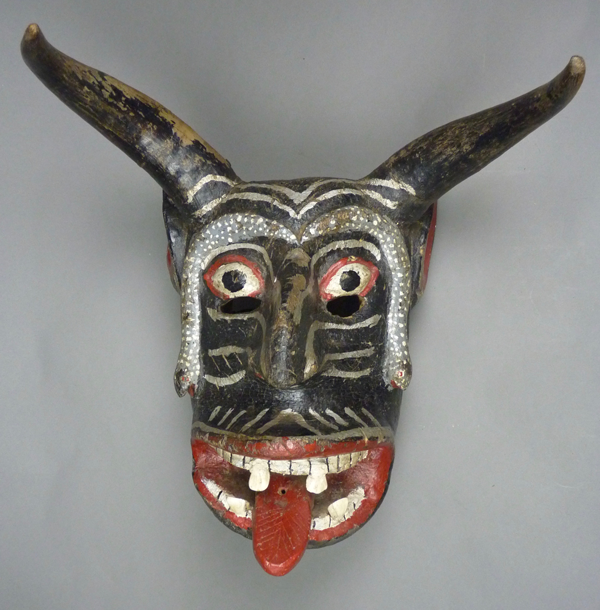 It also demonstrates a feature that was once more common on Michoacán Diablo masks—the presence of a ball between the devil’s teeth. I purchased this mask from Jaled Muyaes and Estela Ogazon in 2003. In sharp contrast, the next mask is very small. I bought this on EBay™, also in 2003. It came with little provenance, but it was said to be from Michoacán. 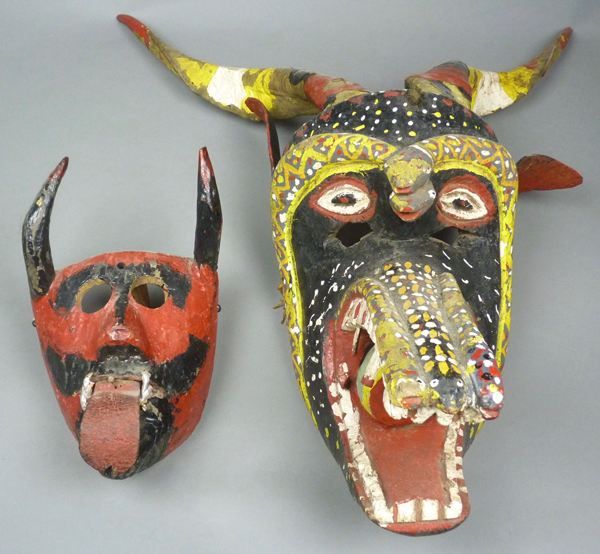 In Barbara Mauldin’s book, Tigers, Devils, and the Dance of Life: Masks of Mexico (page 87, right), there are two smaller Diablos from Michoacán that have this general appearance, one said to date to the 1930s and the other to the 1940s, and both were from the collection of Alexander Girard. Here are today’s first two masks together to illustrate the contrast in size. The very large Diablo has five snakes—three in a row crawling down the nose and two more curling over the eyes. All five are garishly painted. 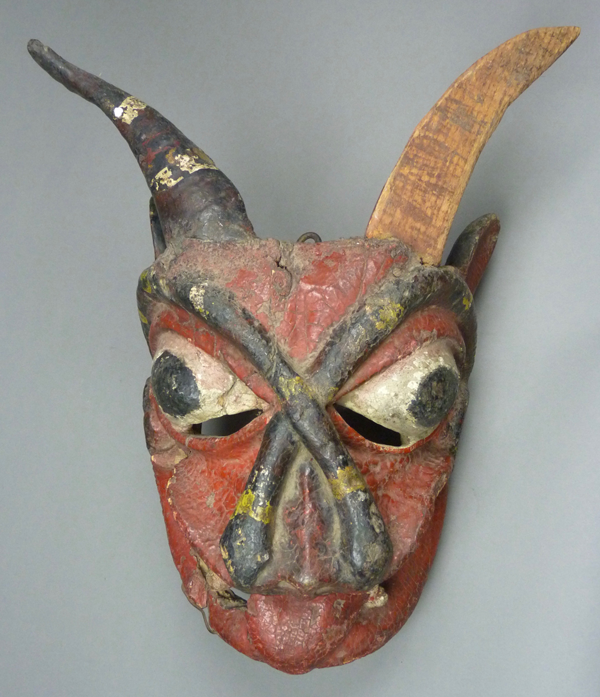 This week we will examine several more older masks from the Mexican state of Michoacán. These three are all from Tarascan Indian towns. Such impressive older Diablo masks are not so easy to find, and a year went by between the time I bought the first one and then the second. I had never realized until I sat down to write this post that, although the first appears to be older than the second, they are by the same carver. I will begin with one that I bought from Jaled Muyaes and Estela Ogazón in July, 1997. I wrote down that Emiliano Fernández was the carver and neglected to note the name of his town. Then when I saw how obvious it was that he had also carved the second mask, I finally learned the name of the town—Angahuan, in the Municipio of Uruapan. Angahuan is a short distance from a nearby smouldering volcano, Paracutín. Here is this old and wonderful Diablo carved by Emiliano Fernández. I have no information about its age but I believe that it dates to 1960 or earlier. It could easily be much older than that. The wooden horn is an obvious replacement. I call your attention to the delicate and artful carving, for example that of the eyes and vision openings. This is the work of a great master, but he worked at a time when such artists had only limited exposure to the larger world. In this example the two snakes are crossed rather than intertwined. Note that one can see carved eyes on the snake to the viewer’s left.